London mayor Sadiq Khan has promised the ‘the biggest ever overhaul’ in the history of Transport for London (TfL), cutting billions of pounds of waste to fund record investment in the transport network. TfL’s draft business plan promises to redesign of every area of its business ‘with value for money at its core’, to generate annual cost savings of £800m a year by 2020/21. TfL also aims to raise £3.4bn for reinvestment in the transport network by 2023, through property development advertising and consutlancy opportuntiies. This work includes freeing up 'spare' TfL land to build 10,000 on TfL land. As well as initiatives already trailed, the plan includes ‘the biggest ever increase in Tube capacity’ and ringing forward the extension of the Bakerloo Line by two years to 2028/29. 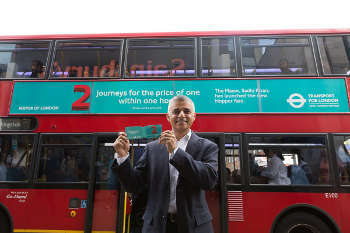 Mr Khan said: ‘The new TfL Business Plan sets out an ambitious and wide-reaching programme that allows us to both freeze TfL fares, and invest record amounts modernising London’s transport’s infrastructure. The plan includes projected savings of £2bn from reducing management layers, including merging functions such as engineering to eliminate duplication, and a further £2bn through ‘renegotiating and bringing together the management of contracts, getting more affordable deals from suppliers, and renewing and enhancing assets in more cost effective ways’. Proposals to save on the £6bn TfL spends annually with suppliers include consolidating facilities management contracts, exiting expensive legacy Private Finance Initiative and Public Private Partnership contracts and bringing together functional teams that have previously been dispersed across TfL, such as engineering and capital delivery. The business plan also promises to 'fully realise' TfL’s advertising estate and to maximise its land and retail estate in support of the mayor’s housing strategy. The promised increase in Tube capacity includes the opening of the Elizabeth line (Crossrail) and new signalling on the Metropolitan, Hammersmith and City, District and Circle lines, allowing more frequent trains, and further upgrading the Jubilee and Northern Lines. Proposals already trailed include a doubling of spending on cycling, rolling out an Ultra Low Emissions Zone, including a transformation of London’s bus fleet, new river crossings such as the Silvertown tunnel, and a further £200m boosting step-free access on the Tube. Aside from Silvertown, plans for major new road tunnels appear to have been dropped. The plan will be considered by TfL’s board on Thursday (15 December).